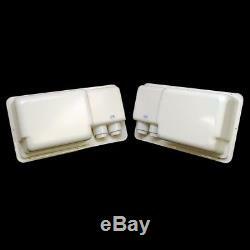 Boat part number 1055070 is a NEW, out of the box, boat coaming box / panel from SSi. 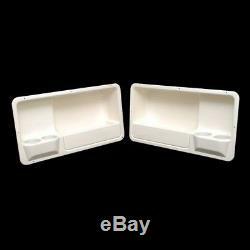 Constructed of glossy, off white colored plastic, this panel measures approximately 29" W x 15 1/2" H x 7" D overall and the inside storage dimensions are approximately 15 " W x 12 1/2" H x 5 3/4" D (the panel that blocks the front is approximately 4" tall) and (2) cupholders have approximate 3 1/2" ID. There are (8) 1/4 dia. Countersunk mounting holes on perimeter. Requires approximate 27 1/4" W x 13 3/4" H x 6 3/4 D cutout. Overall Dimensions: 29" W x 15 1/2" H x 7 D. Cutout: 27 1/4" W x 13 3/4" H x 6 3/4 D. Customers please note every computer shows colors differently. Don't live in the US or Canada? No need to feel left out. You may also reach us using the Ask a Question link at the top of the page. Feel free to send us a message any time! 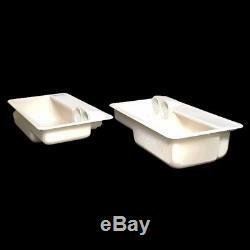 The item "SSi Boat Coaming Storage Box with Cup Holders 29 x 15 1/2 x 7 Inch (Set of 2)" is in sale since Monday, November 5, 2018. 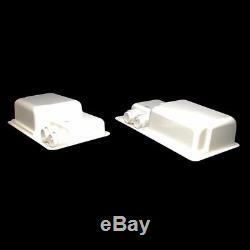 This item is in the category "eBay Motors\Parts & Accessories\Boat Parts\Accessories & Gear\Storage". The seller is "greatlakesskipper" and is located in Racine, Wisconsin. This item can be shipped to United States, Canada, United Kingdom, Denmark, Romania, Slovakia, Bulgaria, Czech republic, Finland, Latvia, Lithuania, Estonia, Australia, Greece, Portugal, Cyprus, Slovenia, Japan, China, Sweden, South Korea, Indonesia, Taiwan, Thailand, Belgium, France, Hong Kong, Ireland, Netherlands, Poland, Spain, Italy, Germany, Austria, Israel, Mexico, New Zealand, Philippines, Singapore, Switzerland, Norway, Saudi arabia, United arab emirates, Qatar, Kuwait, Bahrain, Croatia, Malaysia, Costa rica, Bahamas, Viet nam.